Francisco Pizarro was a Spanish explorer and one of the conquistadors who invaded the indigenous kingdoms of Latin America in the 16th century. He led the conquest of the Peruvian Empire. Pizarro had previously undertaken two expeditions to try to conquer the more powerful Incas, but both had failed. He was eventually killed by his own son, who had become estranged from his father following a quarrel Pizarro had had with his old comrade, Diego Almagro. Very little is known for certain about Pizarro’s childhood, but he is known to have been born in the Spanish region of Estremadura, probably in 1471. His birth, in Trujillo, made him the son of the future colonel of infantry, Gonzalo Pizarro. Gonzalo was to go on to have a distinguished military career, attaining particular recognition for his feats in Navarre and Italy in the army of Gonsalvo de Cordova. The young Francisco, meanwhile, seems to have had a difficult upbringing, with little attention being paid to him by his parents and an incomplete education. The news that a New World had been discovered to the west of the Atlantic Ocean gripped Spain in the 1490’s, and the young Pizarro was caught up in the excitement. Leaving his unsatisfactory family behind him, he made his way to America, where he is known to have participated in the Uraba expedition, led by Alonzo de Ojeda, in 1510. He briefly commanded the new settlement of San Sebastian, which was to be obliterated by hostile native tribes only a few years later. He then went with Vasco Nuñez de Balboa on the voyage which revealed the existence of the Pacific Ocean. For his service, Pizarro was given permission to draw on forced labor from the local people. He settled in Panama and farmed cattle until 1522. Then, he teamed up with a soldier, Diego Almagro, and a priest, Hernando de Luque, to lead a new journey into the south for the purposes of conquest and exploration. The three men later made a solemn accord that they would share equally in the riches that they hoped to plunder from the wealthy empire they imagined lay in the direction of their travels. Despite a period marooned on a small island with only a few of his men for company, Pizarro managed to penetrate far enough south to hear stories of the Peruvian Empire. Panama’s governor was not in favor of an expedition, so Pizarro set sail for Spain to ask King Charles V for his approval in person. The party reached Seville in the early summer of 1528 and quickly persuaded the kind of the benefits of allowing the expedition to go ahead. In July 1529 in Toledo, he granted Pizarro powers over the province he named New Castile. By the start of 1530, Pizarro had not succeeded in fulfilling the requirement to raise a force of 250 men; nevertheless, he set off secretly for Peru. His brother, Hernando, joined him later with more ships, but by the time the group left Panama in 1531 he still had only about 180 men and only 30 horses. Despite the smallness of his force, Pizarro succeeded in subduing the Peruvians, but he had little time to enjoy his triumph. An argument about jurisdiction between he and Almagro led first to combat and then to the latter’s execution. 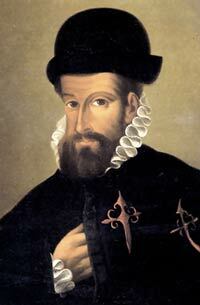 Furious, his followers plotted to murder Pizarro, and he was killed on June 26th, 1541.